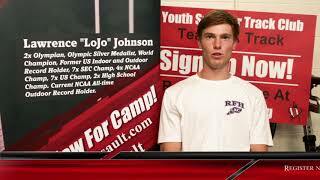 Experience LoJo’s approach to developing the pole vault. 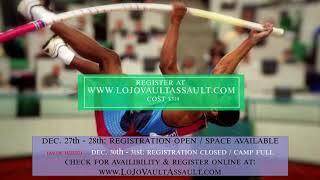 LoJo Vault Assault Pole Vault Camps are for all ages and levels. LoJo’s experience in the pole vault includes earning / winning two (2) HS national championships, former American JR Record, World Jr Decathlon pole vault record, seven (7) SEC titles, SEC Decathlon Champion, NCAA Decathlon pole vault record, three (3) All-Academic SEC teams, seven (7) All-American Honors, , four (4) NCAA championships, seven (7) US National Championships, two (2) Olympic Trials Championships, World Champion (2001), and the Olympic Silver medal. LoJo is the former American Indoor and Outdoor American Record Holder current NCAA All-Time Record-Holder (1996), the only nineteen (19) foot vault ever performed at Penn Relays (standing for 20 years and counting), and the highest American pole vault opening and clearance height ever (19 feet clearance at Mt Sac Relays, 2001). As a coach at the University of South Carolina (2008-2011), LoJo developed and coached one NCAA champion, two (2) SEC titles, five (5) All-American honors, seventeen (17) NCAA qualifiers, an NCAA East Region silver medalist, an SEC Championship silver medalist, and five (5) SEC Championship bronze medalists. As a high school and club pole vault coach (and less than 10 athletes/year) LoJo and Team Vault Assault has supported and coached multiple state champions and HS national finalists from South Carolina to New Hampshire including performances at thirteen (13) feet girls and sixteen (16) feet boys. Currently based in Northeastern Philadelphia at the prestigious Germantown Academy, LoJo Vault Assault enjoys one the best non-collegiate facilities in the US including an indoor and outdoor track, multiple pits, and a gymnastics facility. Check out www.TeamVA.org for details. Recruiting highlights videos are also available. Sample Video link: http://www.lojovaultassault.com/vavideos-brandonkong2016endreview.html . Help Support LoJo’s Vault Assault Community Outreach Project, under the umbrella of the AAU nonprofit 501(c)3. (https://www.gofundme.com/VaultAssault). All donations and proceeds will be exclusively used to provide training implements, equipment, and additional opportunities for disadvantaged inner-city youth. 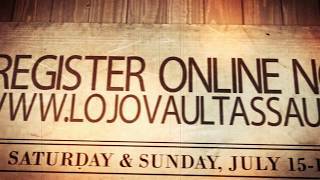 Register for 2017 LoJo Vault Assault Pole Vault Summer Camp! The 2017 LoJo Vault Assault Camp hosted by Team VA is directed and coached by one of the best American vaulters of all-time. Lawrence “LoJo” Johnson is the only 2x high school champion, 7x SEC champion, 4x NCAA Champion, 7x US Champion, World Champion, 2x Olympian, and Olympic Silver Medalist. LoJo set records at every level including both the American Indoor and Outdoor Records. Johnson remains the All-time NCAA record holder (20 years and counting), World Jr and NCAA Decathlon Pole Vault Record holder (with a decathlon score of 7576), and the only vaulter to clear 19’ at the historic Penn Relays. LoJo is also the only American to open and win a competition at 19’. LoJo’s coaching resume is just as prestigious. LoJo began coaching at the University of South Carolina in 2008. Prior to resigning to focus on developing high school athletes, LoJo developed and coached 17 NCAA qualifiers, 8 SEC conference medalists including 2 SEC champions, and five All-Americans in addition to rewriting over 75% of the South Carolina all-time top ten performers for both men and women. While coaching high school LoJo has directly developed, trained, and coached athletes to win multiple state titles and several national championship qualifiers in 4 states up and down the east coast. LoJo’s Team Vault Assault coached less than 30 athletes between 2012 and 2016. LoJo’s coaching commitment to quality over quantity mandated a team roster of no more than 10 athletes per seasons on a first come, first serve basis from 2012 thru 2016.